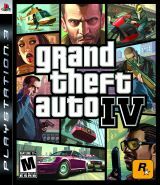 Grand Theft Auto IV isn't a revolution from previous games in the series. Any veterans of GTAIII, Vice City, and/or San Andreas should feel right at home in GTAIV. However, they do make a lot of improvements over the previous generation of the games. This is more than just a last-gen game with a present-gen facelift. Something that should be immediately evident to GTA veterans is that the controls have changed a bit, especially in a vehicle. These changes are a result of various little improvements, like the improved hand-to-hand combat. In a vehicle, you can now aim around with your weapon rather than simply pointing straight in one of just a few pre-determined directions such as was the case in the past. A major change over previous games in the franchise comes from your wanted level and police pursuit of you. Before, you could decrease your wanted level by finding bribe icons hidden around the game world, but these are gone in GTAIV. In IV, you are wanted in a certain area indicated by a circle on your map and minimap, and that circle will be larger with a higher wanted level. To lose your wanted level, you must now flee from that search area and stay hidden from the law for a short time, at which point the trail will go cold and you are a free man. However, if an officer spots you, the search area will update to center around that location. Gone from San Andreas before it are some options for customization. You can still buy cloths and change them for your character, but you don't have nearly as much option for this as you did in San Andreas. Further, in San Andreas you could get a new hair style, jewelry, and tattoos, none of which are options in GTAIV. However, this is probably to keep Nikko in character, since San Andreas allowed us to make CJ pretty goofy if we really wanted to. Nikko doesn't seem like the type to get some goofy green afro or a Mr. T starter kit. San Andreas also gave CJ a number of stats including stuff like body fat and strength, which go up and down based on how much you eat and how much you work out, and none of this has made it into GTAIV, though many gamers complained about these things in San Andreas's day. The world of GTAIV is enormous. 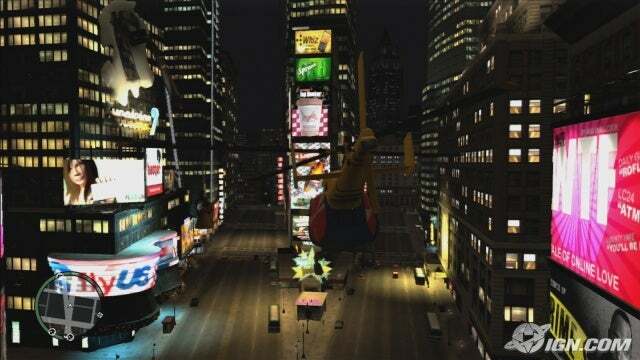 It isn't quite as large as the game world in San Andreas, but while San Andreas was largely open countryside the world of GTAIV is completely packed with urban detail. Rockstar has done a fantastic job of bringing Liberty City (based on New York City) to life and making it feel like a massive, thriving metropolis. 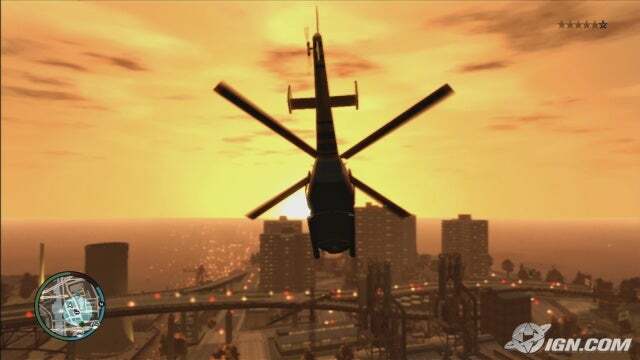 Even in a high-speed sport car flying at maximum velocity, it can take several minutes to rocket across the entire city of Liberty City, which seems to me to be perhaps thrice as large as Liberty City or Vice City in the previous generation. Each area of the city has its own look, and every single chunk of the game world looks and feels like part of a real city. The game depicts video game versions of most of New York City's boroughs as well as part of New Jersey. The game isn't just detailed in the city itself, but the little extras that make the world come to life. Besides being able to enter many of the game's buildings including some in which you can dine, go bowling, play darts, or get drunk, you can also sit down and watch some virtual television in one of your several safehouses. You can adjust the volume and flip through channels in search for something to watch, and the game offers many entertaining programs and even commercials for fictional products. My favorite program is Republican Space Rangers. There are also radio commercials and billboards for fictional, in-game products, programs, or businesses. There is even a virtual Internet you can browse, complete with email, SPAM, and online dating sites. A new and major gameplay addition comes from your in-game cell phone, which gets upgraded to newer models as you progress. You build a list of contacts on your virtual phone, and can phone people up for different reasons, like asking a favor of them or perhaps to hang out with them to build your reputation with them. Better phones include camera functionality, and you can even customize backgrounds and ringtones for your phone. You can go to a virtual website and pay to download new ringtones or backgrounds to your phone. Your phone can even be used to send a signal to a detonator for a bomb you've placed in someone's vehicle. People will often call you up wanting you to do stuff with them or for them. If you have made plans and then cannot commit to them, you can phone up your friend or girlfriend (you can have plenty of them) and cancel your appointment. The gameplay shouldn't need any explanation. Anybody that hasn't been living under a rock during the past several years has surely encountered Grand Theft Auto in one way or another and knows at least something about it. 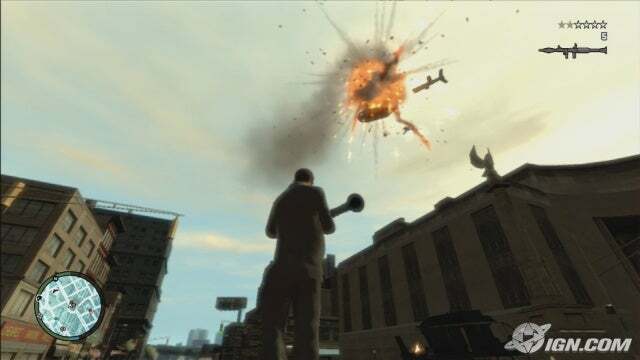 You have complete freedom to wander around in the game's world and do any number of things, to some extent limited only by your imagination, but there are all sorts of illegal things you can do to get into trouble, either on your own or as part of countless missions in the game. Some of the missions are pretty basic, and others can be more complex like a popular bank heist mission wherein you and several accomplices hold up a major bank at the heart of the city, only to have to shoot your way through legions of cops outside complete with helicopters, and your flight eventually leads underground in a desperate escape through the subway tunnels. 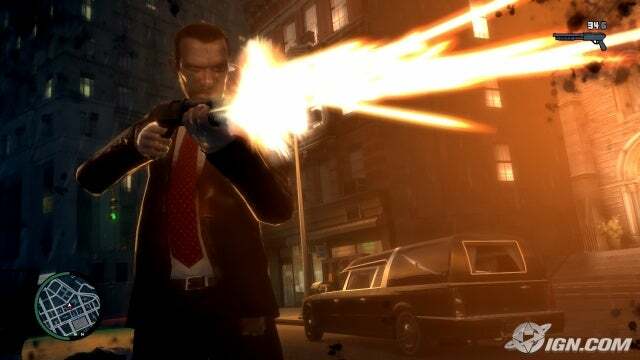 The Grand Theft Auto games have never been the most amazing-looking games on their respective platforms, and GTAIV is no exception, though it has dramatically improved over the previous generation. 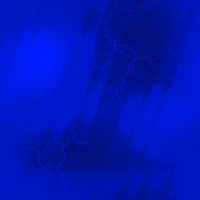 It does do a lot of neat stuff visually, like reflective sheens and reflections on appropriate surfaces and perhaps some of the most impressive weather and day/night effects I have yet seen in a game. However, models aren't as detailed as those in the best-looking games on the Xbox 360 or PlayStation 3, and the textures aren't impressively sharp or detailed, though they get the job done just fine. In fairness to the game, this is probably a limitation of hardware performance, considering the vastness and amount of objects the game is trying to render seemlessly. 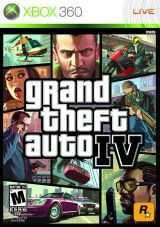 As with previous games in the franchise, GTAIV offers numerous radio stations, many of which being music stations from various genres with several different songs on each as well as some talk stations, all with commercials, and they all sound great. (I like to listen to the humorously biased WKTT, the city's resident conservative station, and the Richard Bastion show is a great parody of Rush Limbaugh's program.) There's lots of voice work throughout the game, all of which is of good quality and the sound effects get the job done fair enough. This is a must-own game for anyone with an Xbox 360 or PlayStation 3 that is of adult age. There is just so much to do here and so much to see in a world Rockstar has beautifully brought to life. The game isn't perfect, but the game offers so much and did so much right that the complaints just don't really hurt it any. This is not a game for children, however, as there is plenty of adult language and situations, and it is illegal to even sell the game to a minor. The game does a lot of neat stuff, but polygon models aren't as detailed as some of the best-looking games out there, and the textures aren't as sharp. Still, the nifty weather effects and other details are pretty. It's hard to complain about the audio in this game. There's lots of music from lots of genres as well as plenty of voice acting that gets the job done nicely. Sound effects are basically what you might expect. Menus are basically the same sort of thing we've come to know from the series, but there are lots of great cutscenes and the game's opening feels like you're watching a major movie. Gameplay is where the series has always shined, and there is so much to see and do in this game. It's still fun just to forget about progressing through missions and just doing your own thing, typically getting into trouble, of course. The game isn't perfect, but there is just so much crammed in here that the random complaints seem trivial by comparison. At a development cost of $100 million, this is the most expensive game in the history of the industry and it shows. This may be the first GTA I pick up. You should definitely give it a try. I couldn't stop playing this game.